Learn the Digital nerve conduit-assisted repair with the NeurolacTM (Polyganics) surgical technique with step by step instructions on OrthOracle. Our e-learning platform contains high resolution images and a certified CME of the Digital nerve conduit-assisted repair with the NeurolacTM (Polyganics) surgical procedure. Digital nerve repairs are common operations in hand trauma. It is important to suspect digital nerve injury in a hand laceration through a sensory assessment. Basic microsurgical skills are required for performing a digital nerve repair. These operations can be prepared using a loupe magnification or under microscope. Digital nerve injuries can occur at various levels. A practical way to describe them is to use the zones of the flexor tendons injury such as zone 1 to 3. Alternatively the surface landmarks such as PIP joint level or DIP joint levels can be used. Digital nerve repairs are technically challenging beyond their trifurcation at the DIP joint level and most people do not attempt repair beyond this level. Certain injuries such as circular saw injuries can result in loss of a segment of the digital nerve. 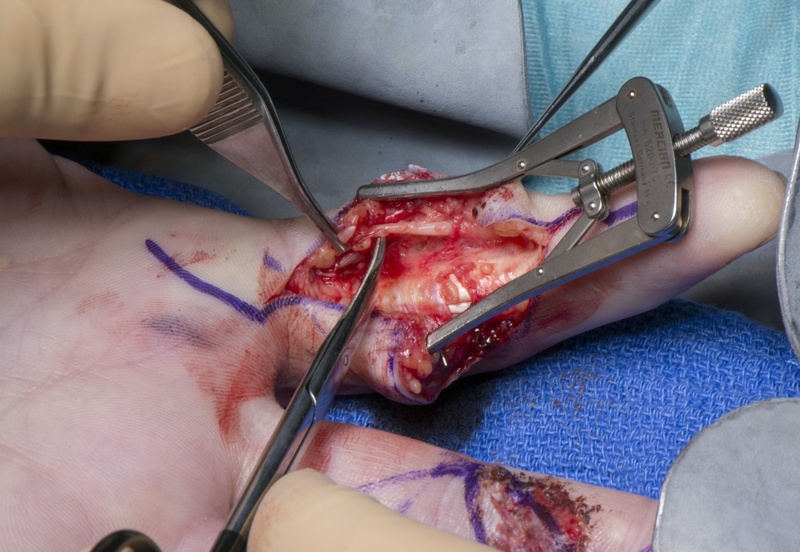 In these cases the options are either not to repair the nerve and bury the stump proximally in the muscles in the palm, use an autologous nerve graft(either posterior interosseous nerve or medial cutaneous nerve of the forearm), allograft or a nerve conduit. A nerve conduit as the one used in this case can bridge gaps up to 20mm. Digital nerve injuries can occur along with tendon and digital vessel injuries. Assessment of circulation through capillary refill time(normally less than 2sec), temperature and pulp turgor can detect vascular injury requiring repair. Tendon injuries are assessed by testing the FDS and FDP tendons separately. FDPs can be tested by asking the patient to flex the DIP joint whereas FDS tendons are tested by immobilising the DIP joints of the uninjured joints in extension and asking the patient to flex the finger. If the patient has a vascular injury needing repair, the surgery is performed urgently and the procedure is called ‘Revascularisation of the finger’. At least one digital artery is repaired and where there is a segmental loss, a vein graft is used to reconstruct the artery. Flexor tendons are repaired as per the preference of the surgeon and the current trend is towards a four-strand core suture and epitendinous sutures. When a patient has a combined flexor tendon and digital nerve injury, flexor tendon repair is done first followed by digital nerve repair. The repair performed here is done using a synthetic neurotube as a protective layer over the repair. This however is a newer advance in nerve repairs with the aim of reducing the risk of a neuroma and a sensitive scar. Neurotubes such as these are either made of collagen or synthetic polymers. The one used here is made of Polycaprolactone(Neurolac, Polyganics Ltd). These tubes can also be used as conduits for bridging nerve gaps up to 20mm. Author: Mr Rajive Jose FRCS (Plastic Surgery). Institution: The Queen Elizabeth Hospital , Birmingham ,UK.